What would it take for Michigan fans to get behind an Ohio State supporter trying to beat Blue? 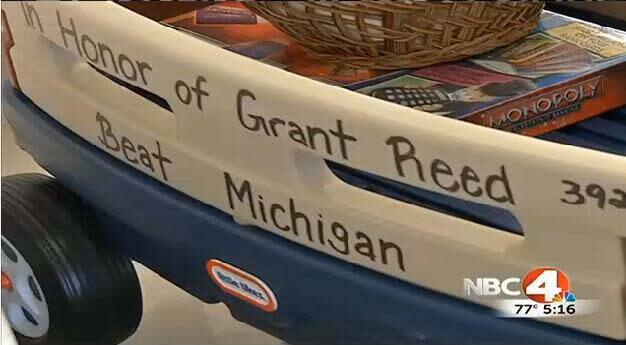 Meet Grant Reed, a Buckeyes fan who even that school from up north would happily rally behind. When Reed, 12, was diagnosed with a brain tumor two years ago, he decided to give the cancer a name: Michigan. Grant’s parents met as members of the Ohio State marching band and their love of the Buckeyes was passed down to Grant and his brother Collin. Grant was released from Nationwide Children’s Hospital last week after completing his final chemotherapy treatment. The diagnosis is good, but he will return every three months for an MRI. Ohio State head coach Urban Meyer stopped by to visit Grant in December, and “was tall and nice,” per the young Buckeye fan. The Reed family has donated two wagons to the hospital to be used by future patients fighting cancer. The only stipulation? The wagons had to have “Beat Michigan” written on the side.